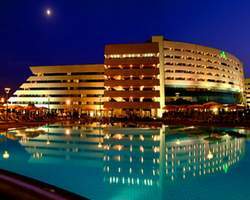 Algiers’s only beachfront hotel, the Sheraton Club des Pins Resort and Towers is the first five-star resort in the country. Sheraton Club des Pins Resort and Towers is located on the western tip of the city at the beautiful and absolutely secured Club des Pins area. Sheraton Club des Pins Resort and Towers look forward to making you feel comfortable in Sheraton Club des Pins Resort and Towers spacious and tastefully appointed guest rooms and suites. Sheraton Club des Pins Resort and Towers business center will keep you connected when you’re away from the office. After a long day, try Sheraton Club des Pins Resort and Towers large free-form outdoor swimming pool (summer season) or Sheraton Club des Pins Resort and Towers health club, which is fully equipped with a gym, indoor pool, steam rooms, and treatment rooms. With fresh Mediterranean breezes and ambience, Sheraton Club des Pins Resort and Towers has an invigorating and creative setting for any group. All of Sheraton Club des Pins Resort and Towers functions rooms are complemented by an easy and endless choice of modern amenities. Sheraton Club des Pins Resort and Towers friendly and helpful staff will ensure every detail is taken care of. Whatever the occasion, Sheraton Club des Pins Resort and Towers are unsurpassed for style, flexibility, and comfort for 10 to 700 guests. Conference and convention attendees will find everything they need. The 700-seat auditorium can accommodate large meetings and seminars, such as the 35 th Summit of the Organization of African Unity in July 1999, which saw the gathering of 45 heads of states. An assortment of rooms are also available including simultaneous translation units, a press centre, head of state suites, a variety of meeting rooms, classrooms, and reception rooms - all equipped with the latest technical equipment. We'll take care of you. All you have to do is have fun and enjoy your stay.